Benefit Number Eighty-Three of spending time with extended family: You learn something new every day. On Saturday I got to browse through reams of old letters, recently collected and filed by my aunt. I learned a lot about my family–most of it classified, concerning things like family tiffs and first kisses. 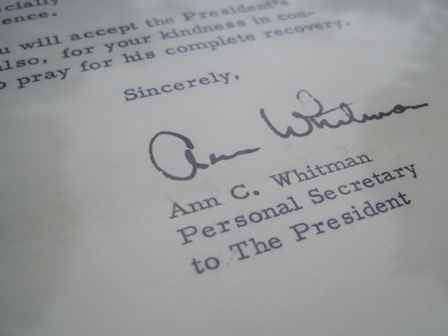 I had no idea that the crippled grandfather I never met, who passed away when my father was sixteen, had a snail mail exchange with President Eisenhower. 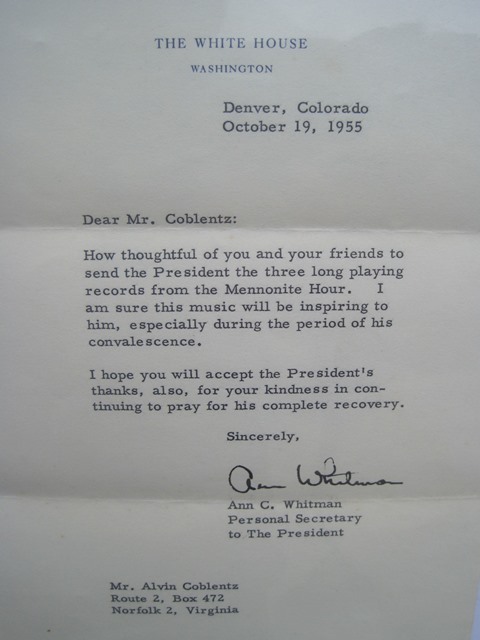 Mr. Eisenhower suffered a heart attack in Denver in September of 1955, necessitating a seven-week hospital stay there, and my Grandpa Alvin sent him a gift in his recovery. Eisenhower was of Pennsylvania Dutch descent himself. I wonder what he felt and thought as he listened. Here is the whole letter. This makes me laugh and wonder. I wonder about the adjective “long”…why did she feel it necessary to specify that? 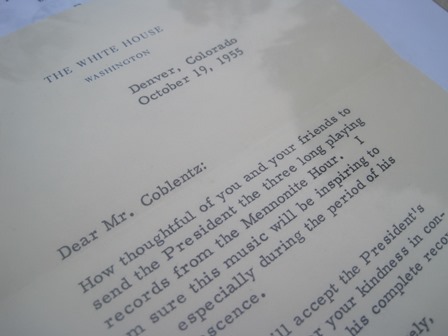 Perhaps, just perhaps, the President’s staff did not enjoy the records as much as he did? 🙂 It’s fun to imagine, isn’t it? Long-playing records were a 1948 invention. Before that, most records could play for only 5 minutes per side. Long-playing meant the new standard: 20 minutes or more a side. It’s so dated, isn’t it? 🙂 This is how our children will be talking about rotary phones. Or iPhones. Ha. Do you know that President Eisenhower retired to a farm in Gettysburg, PA? Very likely he had near neighbors who were plain people. I love family history! Looks like you ran onto some gems. Recently we were helping to clean out a house of a deceased friend. 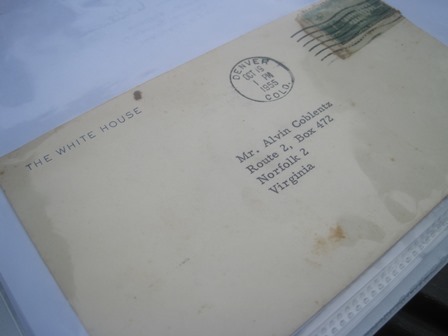 We found boxes full of letters written to her future husband when he was in World War 2. But since they had no children and no descendants, there was no one to give the letters to who would appreciate them. How special that you have a family that will treasure these relics from the past.